The Open and Save buttons allow you to save your current reference images and grids setup for other projects. Opening a previous grid arrangement is often the quickest way to set up a new one. LightBox has a section which can accept your saved grid presets so that they can be quickly loaded into ZBrush. To make sure your grids display in LightBox, save them to the ZBrush 4R5/ZGrids folder. Press Floor to activate the floor grid. The grid can be turned on for different axes by clicking the axis letters at the top of the icon. Turning all three axes on in the icon will activate a floor grid on every axis. The Elevation slider sets the position of the grids relative to the model. Normally the Elevation slider would be set to -1. To position the grids so that they intersect at the center of the model set the value to zero. When enabled, Snap moves the active grids from bisecting the object to being outside its bounding box. This positions them so that they are positioned behind the object, in the appropriate place to serve as supports for background images. Disabling this option keeps the grids at their origin position, centered on the current SubTool’s geometric center. 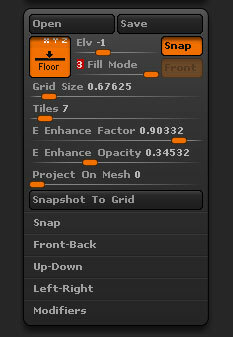 The Fill mode slider, located near the top of the Draw palette defines how the grid will be displayed. 0: The grid is displayed with no transparency. 1: The grid is displayed with slight transparency. 2: The grid is displayed with strong transparency. 3: The grid is displayed with slight transparency and the model with smart transparency. In this mode, the polygons facing forward will be more transparent while those near the edges will be more opaque. The visual effect is closest to a Fresnel effect, producing the best visibility when working with references. You can modify this display mode with the Edge Enhanced and the Edge Opacity sliders, located in the Visibility section. The four fill modes, from left to right and top to bottom. Notice that mode 3 (the 4th image) is the most useful, but having dark colors can make the overall visibility more complex. This mode, located to the right of the Fill Mode slider, is enabled only for Fill Modes 0, 1 and 2. It displays the model with flat transparency to see the background through it. Front mode does not have transparency modifiers. The Grid Size slider changes the size of the grid. The Tiles slider will adjust the number of tiles the grid has. 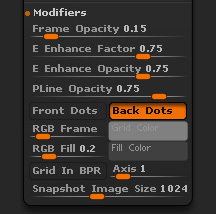 The Edge Enhance Factor slider affects the detection of the angle used to determine transparency. The Edge Enhance Opacity slider modifies the opacity of the background image. 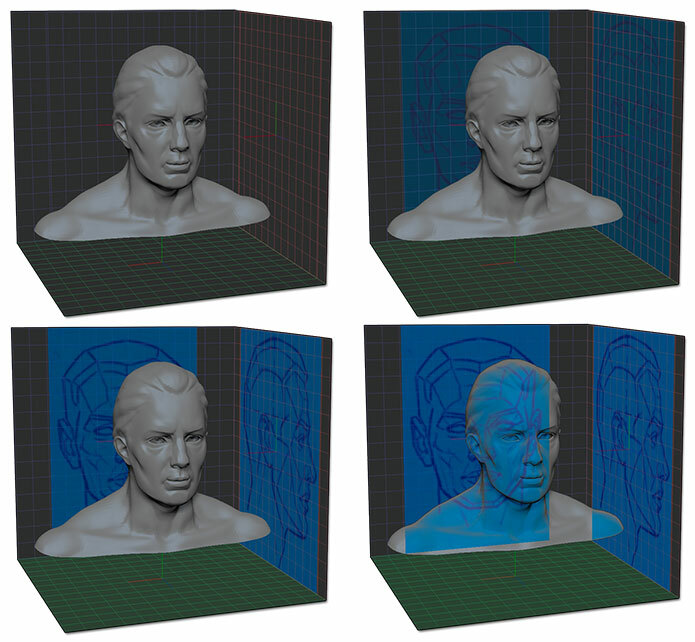 As a result, it alters the overall strength of the model’s opacity. The Project On Mesh slider controls the opacity of floor grid images projected onto the mesh. If the model has subtools then the images are projected onto all subtools. The grids themselves are hidden when this slider is in use. A setting of zero disables this feature. This function creates screenshots of your current model from all isometric angles and applies them to the grid planes. To export a snapshot image, click on the image thumbnail and choose Export from the pop-up. The model has been snapshot and the resulting images have been applied to the corresponding working planes. This mode enables Position and Size modes described below. It causes them to operate based upon the currently selected SubTool. Enabling this mode, overrides the Grid Size slider, causing it to have no effect. This mode is similar to Snap to Mesh mode, except that it causes Position and Size to operate on all SubTools. A reference image applied to the front grid but not applied as a ShadowBox texture. When starting ShadowBox with this mode enabled, the visible grids will be automatically positioned and scaled to fit the ShadowBox working plane. This option makes it easier to use references images in ShadowBox. Note: The references images on the grid are not a substitute for the ShadowBox working plane texture. Using both may make it more complex to work with background images. The Up-Down and Left-Right sections have exactly the same options. Two selectors are available, letting you select different images for the inside of the grid (first selector) and back/outside of the grid (second selector). If the corresponding grid was previously disabled, assigning an image using these selectors will enable the grid. These selectors are also used to disable to replace the current image. This mode uses the left image slot for both sides of the grid. If an image is loaded into the second slot, it won’t be displayed on the grid. Projection Lines go from the cursor to the corresponding working plane. This mode projects a line from the cursor to the visible Floor grids with the corresponding axis color. 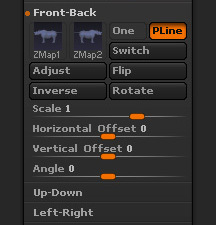 The position is displayed in the ZBrush title bar. 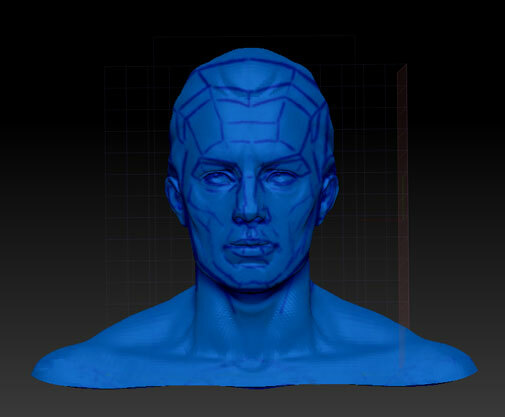 These lines make it easy to ensure that your sculpting work remains true to the reference image. This function swaps the textures loaded into the associated grid’s slots. The inside texture will be moved to the outside position and vice versa. This option opens a dedicated image editor, similar to ZBrush’s JPG exporter with which you can manipulate your original image directly within ZBrush. The most common use of the Adjust window will be to crop the image. It is also useful for changes such as improving the contrast of your reference images. These functions provide basic manipulation to rotate the loaded reference image by 90°, flip it horizontally or invert its colors. If you wish to flip your image vertically, simply rotate it 90° twice and then flip it. These four sliders manipulate your image within their respective grid so that you can fine tune the image’s rotation, scale and position. If your image moves partially outside of the grid, it won’t be cropped. Note: It is not possible to directly scale an image larger than 100%. Instead, increase the Grid Size value, after which you can use Scale to reduce the image’s size as necessary. The Frame Opacity slider sets the universal opacity for all grids, from fully opaque to invisible. The Projection Line Opacity slider sets the opacity for the axis lines that are projected from the brush cursor to the corresponding grids when the PLine option is turned on. This mode makes the model 50% transparent by alternating pixel visibility. It only has an effect when the model is in front of a grid and that grid has no applied texture. This mode makes the model 50% transparent by alternating pixel visibility. It only has an effect when the model is behind a grid and that grid has no applied texture. This option allows a BPR render to display the model and its shadow through a grid. Note: This option is mostly used when recording a History movie with the original camera positioning. It will allow your movie to continue to show the model even when the camera moves behind the grid. These two sliders will fill the grid lines and/or the floor surface more strongly with the corresponding axis color: Red for X, Green for Y and Blue for Z. These two color pickers let you change the color of the grid itself and its background. Note that the RGB Frame and RGB Fill sliders will over-ride these colors completely if they are set to 1. This mode shows the grid lines when doing a BPR render, but not any textures assigned to the grids. This slider defines the size of each image created by the Snapshot to Grid function. High values produce images with better quality but will require more memory.